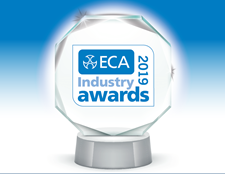 The ECA Industry Awards recognise the accomplishments of ECA registered members and other representatives from across the electrotechnical and engineering services industry. Find out more about the Industry Awards and see the 11 categories below. What are the benefits of entering an ECA Industry Award Category? Whether a winner or a category finalist, your business will be able to impress clients and customers with your achievements, helping to boost reputation and win new contracts. Read how industry recognition impacted on the success of 2018 winners and highly commended from ECAtoday. All category highly placed entries will receive 2 FREE tickets to the ECA Industry Awards Dinner 2019, where outright winners will be announced on Friday, 7th June 2019, due to take place at the prestigious Hilton London Bankside Hotel. All category winners will receive an engraved award that can be displayed within their workplace. All category winners will receive a set of professional photographs that can be used for publicity purposes. Winners and those that receive special commendations will receive logos that can be placed on all company marketing materials and websites. Post-show publicity will be extended across all ECA marketing and promotional channels and to the electrotechnical and engineering services industry with details of all winners, including photography. Open to engineering services businesses with an overall turnover of over £20 million. Ideal for companies that have been involved in a new build or refurbished project where the member has played a key role in delivering a significant energy-related solution. Ideal category for specialist contractors - and is open to companies with examples of success in the design, installation, commissioning, maintenance and (or) monitoring of any type of electrotechnical or engineering services activity. Open to ECA registered members of any size that have done something exceptional to improve occupational safety and/or health. Open to ECA Registered members of any size whose training programmes or initiatives have made significant, tangible and positive improvements to the contractor’s business and/or customers or the wider industry. Open to ECA/FSA members with compelling examples of success in the design, installation, commissioning, maintenance and (or) monitoring of any type of active fire detection, life safety and (or) security systems. Open to any electrotechnical manufacturer, wholesaler/distributor, of good industry standing, who has been supplying any part of the electrotechnical sector in England, or Wales and/or Northern Ireland, for at least the two years. Open to any individual who is active in any part of the electrotechnical and engineering services industry who has made a significant and positive contribution to the industry. What are the entry rules? Before you enter your work into ECA Industry Awards, we have got few rules to keep your unrestrained creativity in check. 1. All entries for the contractor categories (award categories 1-9) must be current ECA Member businesses of good standing. 2. Entries for the manufacturer awards category (category 10) are open to companies that supply the electrotechnical contracting industry in England Wales and/or Northern Ireland with products meeting the required UK standards. 4. Companies and organisations can enter any relevant category or categories; however no company can win in more than 2 categories. collectively) in a higher turnover band. Entries in turnover-specific categories must refer to their business turnover. 6. Entries received after the submission deadline will not normally be considered. 7. All entry forms need to be returned to awards@eca.co.uk. 8. Entries are only accepted on the official entry form. All supplementary information must be attached to the entry submission email. 9. All entrants agree to be photographed for ECA promotional purposes. 10. The ECA reserves the right to publish press releases, articles, case studies and photographs and to carry out positive publicity activity relating to the entrants and winners. 11. Winners will be announced at the ECA Industry Awards Dinner at the prestigious Hilton Bankside in London on Friday 7 June 2019. 12. The judges’ decision is independent and final. 13. Correspondence will only be entered into at the ECA’s discretion, and will not refer to other entrant's entries. What is the best practice for an Award submission? Read the criteria thoroughly and think about your business strengths and achievements you are most proud of. If you are not sure whether you meet the award category criteria, please email awards@eca.co.uk for more guidance or speak to your Regional ECA Office. Make sure your work colleagues and senior management are aware of the awards. They may be able to help you with valuable information, feedback and offer secondary opinions that will help maximise your chances of being shortlisted. To make your case for an award as strong as possible, provide us with hard evidence like facts, statistics, pictures and customer testimonials. The judges have a lot of information to digest so it is important to make it as easy as possible to read. Try to get across your company personality and help us to understand your business and why you are proud of how you operate. If you are passionate about your business this will come through and judges will be more likely to remember your entry above others. It doesn’t have to be a long story, just a compelling one. Make sure you submit your entry using the correct form, keep to the word count, answer every question on the form and submit your entry before the deadline i.e. 15 March 2019! Before entering, read the entry rules and check if your business is eligible. To enter, submit the ECA Awards expression of interest form, we will then respond to you via email with all relevant details required for your entry or entries, including the entry form(s). Fill in your entry form(s) and email it to awards@eca.co.uk by COB 15 March 2019. If you have any supporting evidence, attach these to your email. If you should require any further assistance with your entry or entries, please contact awards@eca.co.uk, call ECA marketing team on 020 7313 4800 or contact your regional office. If your entry submission email exceeds the total size of 14MB, please share your submissions via ‘We Transfer’ or ‘Dropbox’ to awards@eca.co.uk. For assistance with the ECA Industry Awards contact awards@eca.co.uk or the marketing team on 0207 313 4800 or your ECA Regional Office. Want to network with key decision makers of the UK construction industry?